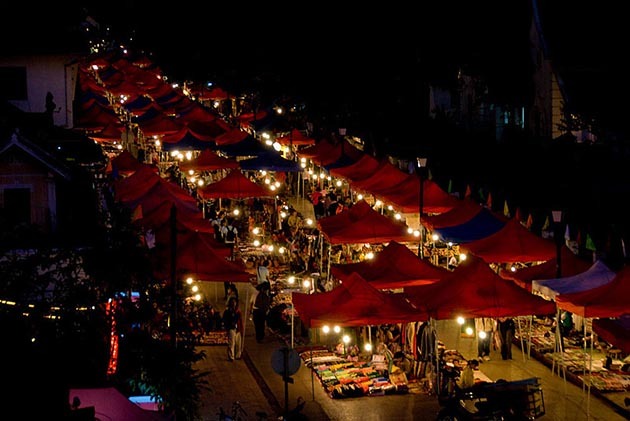 Luang Prabang night market has become one of the highlights in Laos Vacation. Travel in the night market, you can see lots of products sold by the locals with a variety of colors. 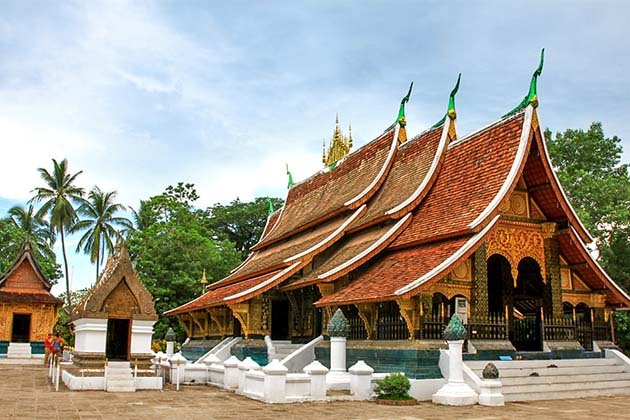 Strolling around and choose for yourself the gifts which bring spirits of Laos. 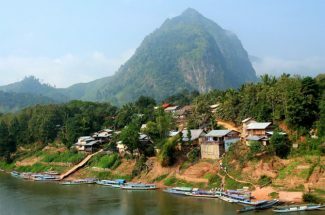 Additionally, you can see the paradise of Laos food from the north to south made you cannot refuse. 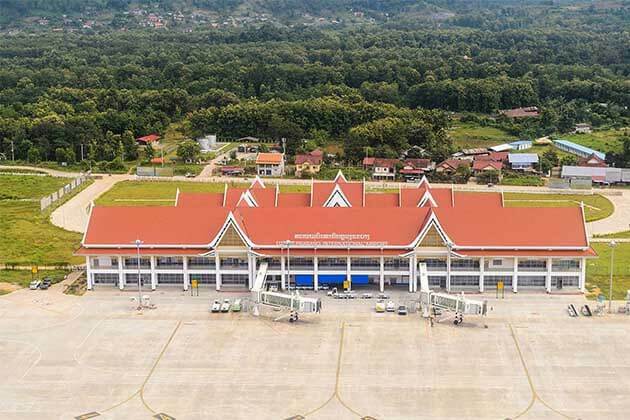 So, Have you ever gone to Laos yet? Let’s travel with us! 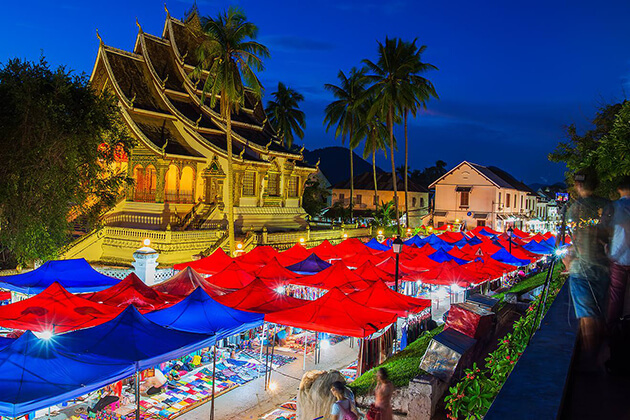 Luang Prabang night market is the most popular part of Luang Prabang that cannot be missed when visiting this charming city. This is one of the biggest night markets in Southeast Asia, a specialty of the tranquil land full of delicious food and interesting items that makes tourists overwhelm. 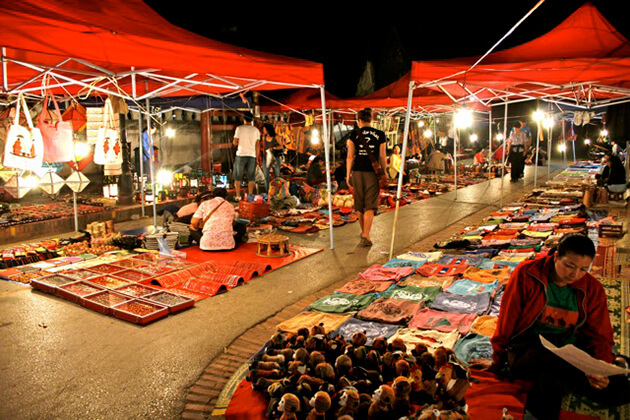 The night market is situated along Sisavangvong Road, about 1km with a lot of stalls. 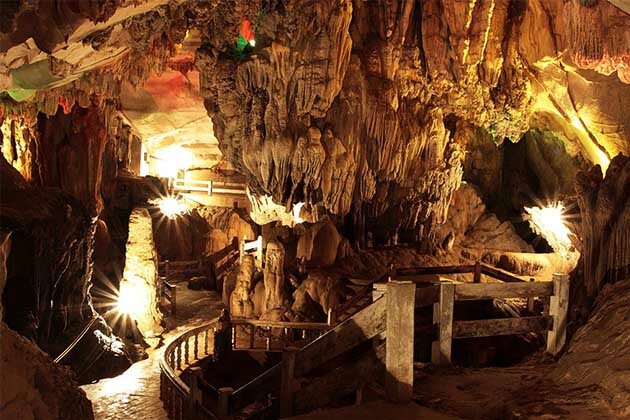 It is opened all days of the week from 5 p.m to 10h30 p.m and especially crowded on weekends. 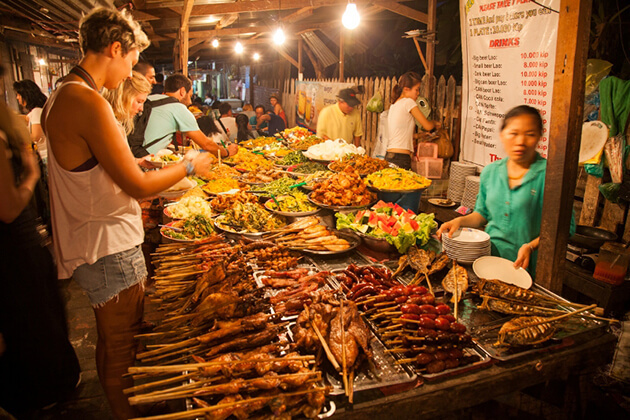 Luang Prabang night market is considered as a food paradise with numerous kinds of food like the noodle, fried rice, spring rolls, fruit juice, ice-cream, grilled meats, buffet close together. All the stalls are decorated beautifully and attractively, foods and drinks are kept in boxes, then tourists just need to point the wanted things, sellers will put it into the takeaway bags quickly. If you are a food lover, you will be overwhelmed with so many foods here. Bowls of noodles look tasty with salad and tomatoes decoration. Spring rolls, fried rice and most of the meat dishes are reasonable prices fluctuated from 10.000 t0 15.000 kips per box. Some stalls have tables and chairs for tourists but some are take-away. The more you come into the market, the more you see the rich cuisine of Laos. Many fragrant barbecues stalls welcome tourists by attractive dishes like meat skewers, grilled shrimp and fish and sausage. Especially, there is a food alleyway, which has not only Laos traditional food but also China and Thailand food. Step into the alley, you will see a variety of food stalls like a meat stew and many traditional fried dishes with sticky rice. Around the night market, a lot of stalls sell a hot cake called coconut pancake, which is put in a box neatly at the cheap price of 5000 kips per one. There are also many different kinds of cakes: choux cream, donut, and colorful sweet cakes. The most significant thing maybe is buffet stalls for all people and vegetarians with 15.000 kips per person. Each one has a big bowl, and you can get as much food as you want, but only once; besides vegetarian dishes, it also has salty food like chicken thighs, grilled meats, sausage, beef, fish and of course the Beerlao beers, if you want more, you have to pay extra money for that. You cannot resist these mouthwatering dishes and surely you won’t leave without full of food in your hands. If you are bored with salty foods, you can find dessert stalls around with a variety of fruits about 10.000 to 15.000 kips per fruit box. After the food show, you will see the logic of Laos when setting all the food stalls right at the beginning of the market. Laos people are so thoughtful as they want tourists to fill their hungry stomach before walking around the souvenir stalls area. 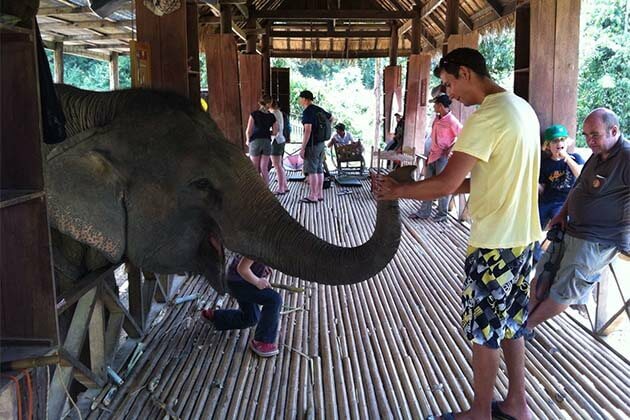 In this area, you will be impressive by different commodities made from this beautiful “Millions Elephant Country”. All the handicrafts, textiles, exquisite ceramics, antiques, paintings, coffee and tea, quilts, shoes, silvers, bags, bamboo lamps of different shades and sizes, soft toys jewelry, wooden crafts, slippers, aprons, smoking pipes, lanterns…are displayed. 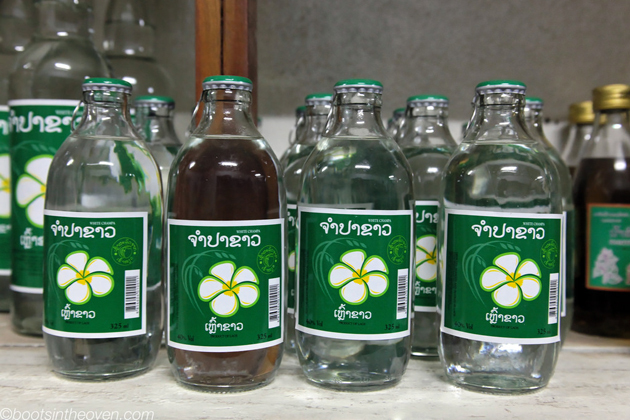 There are a lot of interesting items that are hard to find anywhere else such as snake and gecko wine or even animal’s teeth. Many tourists buy bags and wallet embroidered colorful patterns with different sizes or T-shirt bearing Luang Prabang iconography as presents when coming back home. 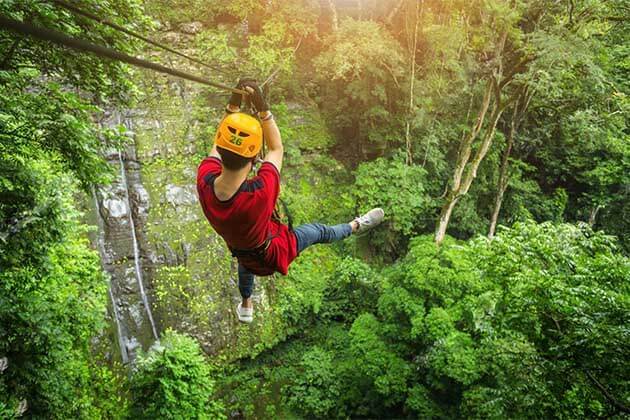 The best thing here is the working style of all the vendors, no pushiness and exaggerated action, they do not tend to harass visitors for trying to sell their products, they are friendly and helpful. The price of products and items are sold in the Luang Prabang night market tend to be fixed price, obviously marked and clearly visible on each item. Bargain less happens in the night market of Luang Prabang as the prices are reasonable compared to the living standard of Laos and the good quality of hand-made items. Taking a leisurely walk around the Luang Prabang night market is an enjoyable experience when visiting this peaceful city. Come and create your own good time here!